Zumba | StyleAble Fashion For Everyone! Being visually impaired myself, I know that joining a traditional gym when you have sight loss can be very frustrating. Equipment can often be very complicated and difficult to operate, venues can be too big, staff are hard to find and there is never a great deal of help or assistance for people with a visual impairment. Because of the bad experiences I have had in the past, I never really thought that I would find a suitable fitness club…that was until I heard about Curves. Curves’ Gym is a 30 minute fitness and health club for women – yes that’s right, no men! Each class and session is 30 minutes long – meaning they provide you with a total body workout without exhausting you with endless routines. They also provide an automated machine that tells you when to move on to your next exercise machine. For someone like me, the fitness equipment is great, straight forward and very easy to operate…in fact there are absolutely no buttons to press or screens to read. If, due to your sight loss you feel isolated when you attend a gym, you won’t at Curves. The friendly and attentive staff are always there to guide and ensure that you are using the equipment safely. (They also provide one to one sessions to help you familiarise yourself and become comfortable with the machines). Sounding too good to be true? Well there were a couple of bad points. I visited the Bromley branch and the notices and pictures on their walls were far too small for me to read. The venue is also found on the 2nd floor, yet they don’t have a lift! Despite this, the Curves staff really provide excellent customer service. 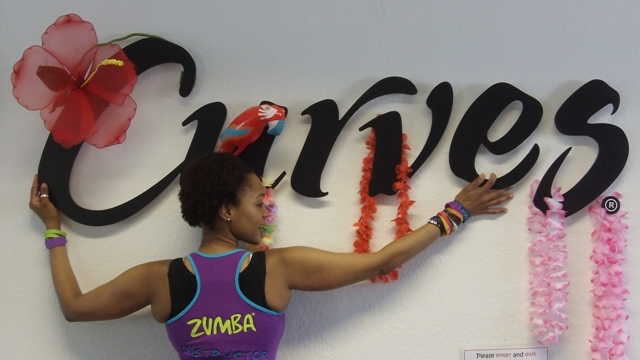 Curves also offer Zumba Fitness classes. Zumba, meaning ‘to move fast and have fun’ is a Latin-inspired fitness program created by dancer and choreographer Alberto “Beto” Perez in Columbia. This exercise involves dance and aerobic elements, following upbeat and slow music as well as resistance training for fitness and losing weight. To be honest, I have always been sceptical and anxious about joining dance classes – the worry of not being able to see and follow the dance steps has always put me off. However, when I joined the Zumba class, my opinion changed completely. Our teacher Ana Sampaio was very considerate and she put a lot of emphasis on personal attention. She also made the class exhilarating and fun! The Bromley Curves venue is small compared to a traditional gym, so if you are blind or partially sighted, it is very easy to get around. Because the Zumba classes were also smaller than normal, I found it more comfortable and much less intimidating. They were also much better for me as I found it easy to follow the dance steps with the teacher just in front of me. Zumba with Circuit combines reggaeton, salsa, merengue, soca, and hip-hop – so if you enjoy shaking it up whilst learning some fancy footwork in a safe environment then Zumba at Curves is for you!